With elegant curves and premium finishes, the Samsung Gear S2 will turn heads. The circular interface and rotating bezel give you effortless navigation, so you can quickly access the things that are most important to you. This intuitive interface lets you easily access important notifications, texts, and updates from your phone with just a glance at your wrist. The built-in S-Health app tracks your steps, your heart rate, and even gives you a nudge when it?s time to get moving. And with built-in wireless charging, it?s easy to keep the Gear S2 powered up. Whether you?re at home, work or anywhere in between, you can power up by simply setting your Gear S2 on the included wireless charging dock. Plus, with easily customizable watch faces, you can customize the Gear S2 to fit your unique style. With powerful capabilities and sleek looks, the Gear S2 will help you get the most out of your day. Alessandro mendini designed Watch band for the Samsung Gear S2. Comfortable elastomer material band is waterproof so it can go with you from the office to the gym. Only Compatible with the Gear S2 smartwatch. With elegant curves and premium finishes, the Samsung Gear S2 SM R7200ZKAXAR will turn heads. The intuitive circular face and bezel let you navigate effortlessly to get to what you need. And with access to important notifications at a glance, you can get more out of every moment of your day with the Samsung Gear S2. A revolutionary design keeps everything you need at your fingertips. The circular interface and unique rotating bezel let you navigate through notifications, apps and widgets quickly without covering the display. With elegant curves and premium finishes, function meets style in the Gear S2. Personalize it with custom watch faces to create a Smartwatch that is uniquely your own. 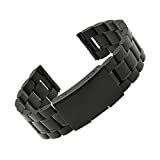 Threemart Watch Strap for Galaxy Gear S2 Classic SM-R7320 Replacement watch band for Gear S2 Classic SM-R7320 Only, Does Not Fit Gear S2 (SM720 / SM-730)!!! Made of high quality stainless steel giving you a good wear experience The strap length can be adjusted according to your wrist Durable and sturdy perfect fit for Galaxy Gear S2 Classic SM-R7320 Smart Watch Package Contents: 1 x watch strap, 1 x tools set Threemart After Sales Three Month Warrenty - We promise that any Threemart product sold from Threeeggs has problem during the period, please contact us for a replacement or a full refund. With elegant curves and premium finishes, the Samsung Gear S2 classic will turn heads. The circular interface and rotating bezel give you effortless navigation, so you can quickly access the things that are most important to you. This intuitive interface lets you easily access important notifications, texts, and updates from your phone with just a glance at your wrist. 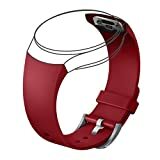 Plus, with easily customizable watch faces and a premium 20mm leather watchband, you can create a watch style that is uniquely yours. The built-in S-Health app tracks your steps, your heart rate, and even gives you a nudge when it?s time to get moving. And with built-in wireless charging, it?s easy to keep the Gear S2 classic powered up. Whether you?re at home, work or anywhere in between, you can power up by simply setting your Gear S2 on the included wireless charging dock. With powerful capabilities and sleek looks, the Gear S2 classic will help you get the most out of your day. Samsung Gear S2 Smartwatch: Stay connected even when you're away from your phone with this smartwatch, which receives texts, e-mails and notifications and features S Health and Nike+ Running integration to track your health and fitness. The 1.2" Super AMOLED touch screen makes it easy to navigate apps and Web pages. 4GB of internal memory gives you the chance to add apps to your Gear S2 as well as fill it with up to 300 songs for phone-free listening over Bluetooth headphones. It is IP68 rated for water- and dust-resistance and is powered by a 1 GHz ARM Cortex-A7 dual-core processor with 512MB of RAM. The 250mAh battery can recharge via the included wireless charging dock. Wireless charging dock in White, Compatible with all Samsung Gear S2 models including the Gear S2 and Gear S2 Classic. With wireless charging, it's easy to keep the Gear S2 powered up. Simply place your Gear S2 on the charging dock to activate wireless charging. Straight from Milan, Italy, the Samsung Atelier Mendini Band for the Samsung Gear S2 lets you sport your smartwatch with both form and function. The band is made from a flexible elastic for an easy fit. Designed by renowned designer and architect Alessandro Mendini, these eye-catching designs are guaranteed to turn heads.